View of the entrance to the Port of Constantinople, Seraglio Point, Chalcedon, and the Asian Shore. A version, View of the City of Constantinople between the Seraglio Point & the City of Scutary..., engraved by J.W. Edy, published 1794 by J. Harris: see SP.374. Cf. a version, with nine other views of Constantinople and the Bosphorus, all inscribed and all signed by Clara Barthold, except one signed Clara Mayer (née Barthold): on the art market, June 1979. Cf. 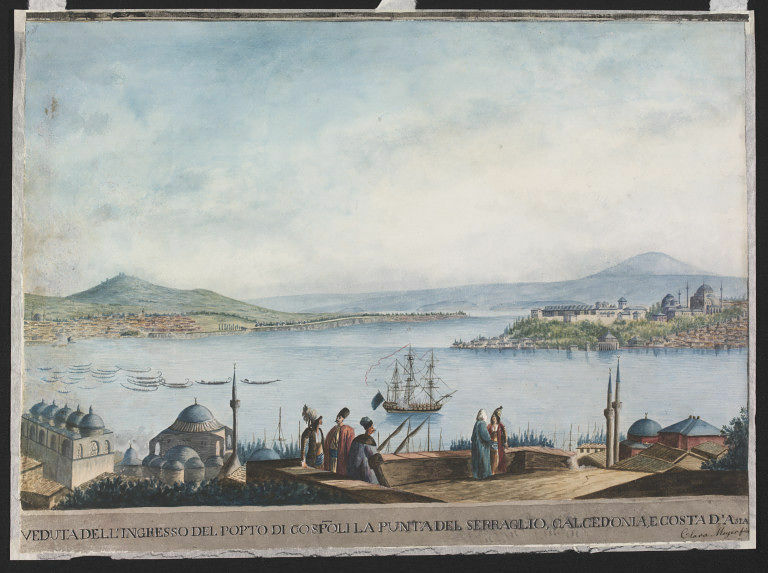 also, VEDUTA DELL'INGRESSO DEL PORTO DI COSTANTINOPOLI, LA PUNTA DEL SERRAGLIO, E LA COSTA DELL'ASIA, DA SCUTARI SINO ALLA PUNTA DI CALCEDONIA.., no.IX of several views of Constantinople and the Bosphorus by Luigi Mayer, on which Clara's watercolours are based: in the BM, PD (C.195) See list in Searight Archive. 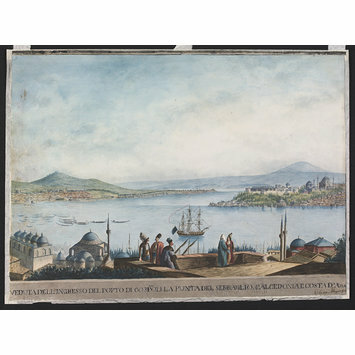 A series of twenty-seven views of Constantinople and environs were engraved by Thomas Milton and published by Thomas Bensley of Fleet Street, for the Bowyer Historic Gallery, Pall Mall, in 1801: see Sotheby's, 27.11.80 (19 & 22).